What does it mean to be a religious conservative, particularly for a woman, in America today? Drawing on two years of ethnographic research in Catholic, Protestant, and Jewish communities, Christel Manning explores the diversity of views among women who have returned to tradition. Arguing that America has undergone profound cultural and economic changes in the last thirty years--changes that have created tension between women's lives and traditional gender roles--she demonstrates that conservative Catholics, Evangelical Protestants, and Orthodox Jews negotiate those tensions in a variety of ways. Manning explains how they deal with the contradictions arising from their attempts to integrate feminist and traditionalist norms. The comparative kaleidoscope that Manning presents of these women's views on feminism, however, shows them to be deeply rooted in the diverse theologies and historical experiences of their communities. Manning, Christel. 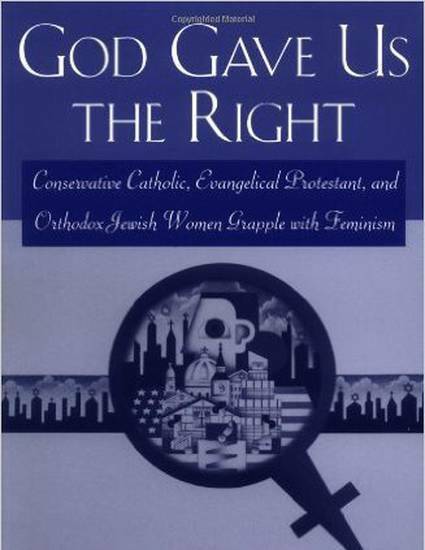 God Gave Us the Right: Conservative Catholic, Evangelical Protestant, and Orthodox Jewish Women Grapple with Feminism. New Brunswick, N.J.: Rutgers University Press, 1999.